Pound has been supported by manufacturing PMI on Wednesday however it is still affected by the forthcoming referendum. The US is also broadcasting Wholesale Inventories and Wholesale Sales (M/M). GBPUSD has been volatile recently and yesterday it tried to move with bullish bias however it fell again. 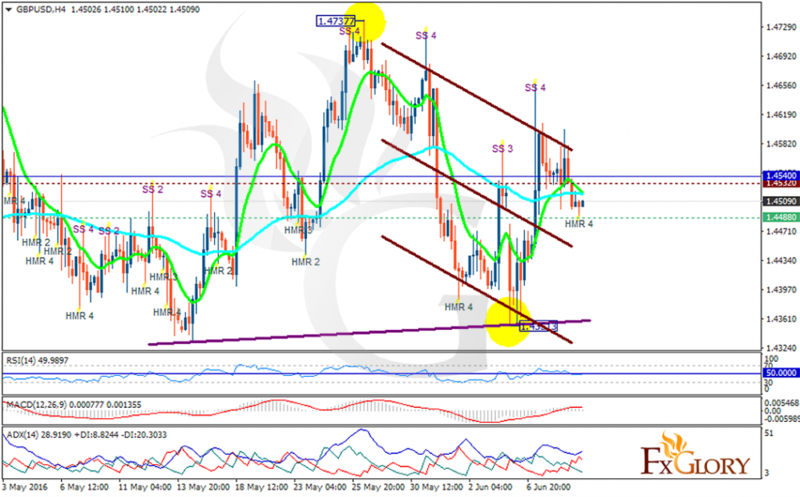 The support is now at 1.4488 with resistance at 1.4532 which both lines are below the weekly pivot point at 1.4540. The EMA of 10 has reached the same spot as the EMA of 75 in the neutral zone. Indicators are not presenting any clear signals; the RSI is moving around the 50 level area, the MACD indicator is in neutral zone and the ADX is showing strong sellers. It is difficult to see the pair next move however the support level breakthrough will drop the price towards 1.4400.